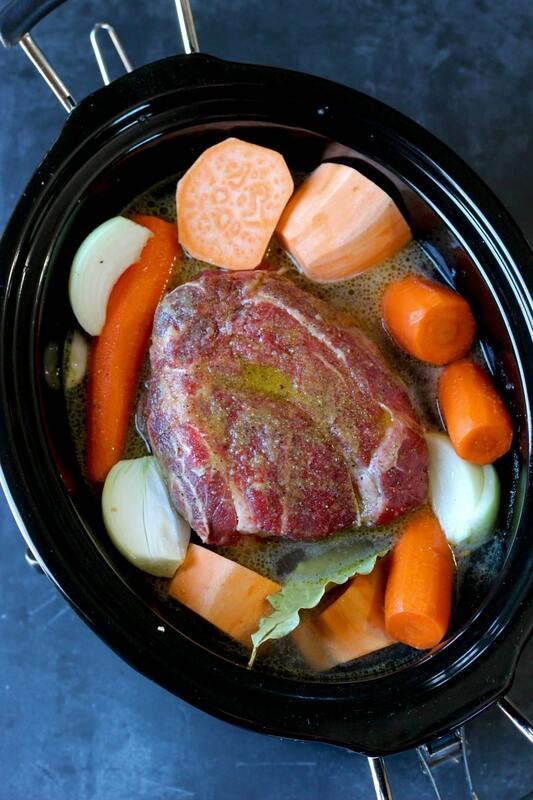 Melt-In-Your-Mouth Slow Cooker Pot Roast and vegetables. 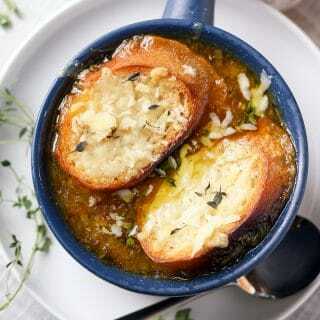 This recipe also makes 4 cups of homemade beef broth! 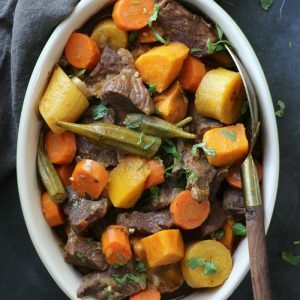 Technically we are moving towards spring foods, salads, vegetable dishes, smoothies and such, however in all honesty I am still enjoying warm and comforting dishes like this Pot Roast on those occasional cold and damp spring nights. 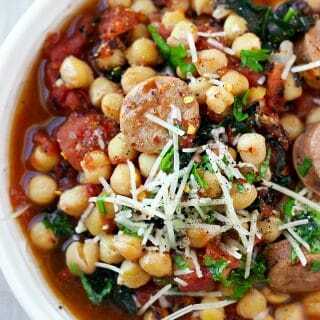 The slow cooker method in my opinion is fantastic to use all year round because it not only enables you to get other things done while the cooking is happening, but also because it doesn’t heat up the kitchen, like ovens do. —>> Check out this Readers Favorite Slow Cooker Turkey Chili! Additionally, I find that it’s important to mention that some people prefer to eat warm foods, and by ‘warm’ I don’t just refer to the temperature but rather cooked, comforting and fulfilling meals. The opposite to that would be raw, cold and uncooked meals, which is quite popular in today’s modern diets. 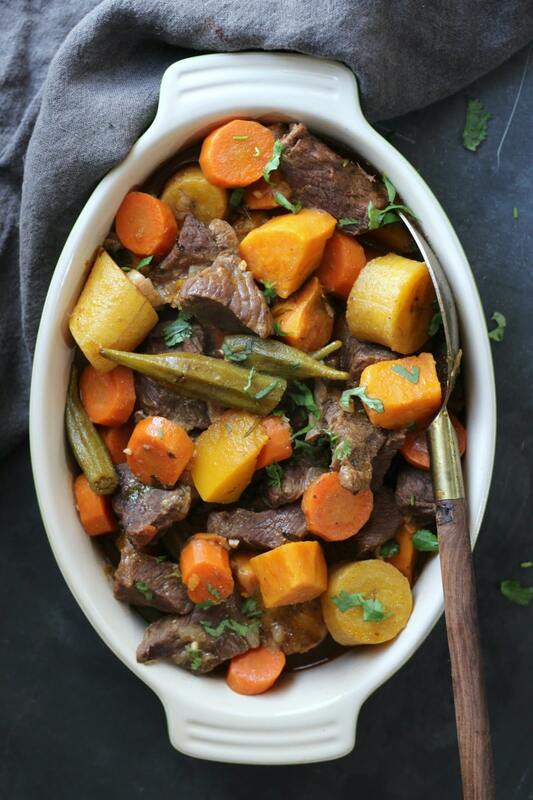 Check out this d-eee-licious Beef Stew recipe! Here are my two cents on the idea of using a crock-pot all year round; Spring and Summer are two precious seasons. Every minute in the sun is like gold, so keep your crock-pot out for the season, prep your beef and let it cook itself while your enjoy the sunshine. I mean it!! Do some gardening, take a stroll, get out there! Ah, and on more thing… notice I added ‘water’ to the pot, not broth… or just the roast like most recipes. 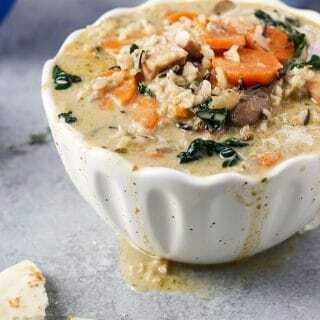 In this recipe we are also going to be making homemade broth!! Isn’t that wonderful? You have my word -this dish ain’t less tasty and flavorful because you are adding water. 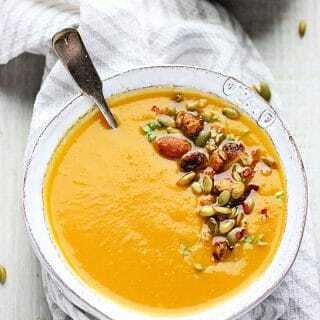 The special mix of spices and veggies are enough to add flavor to the meat, all while creating a flavorful broth that you can use in so many other recipes! 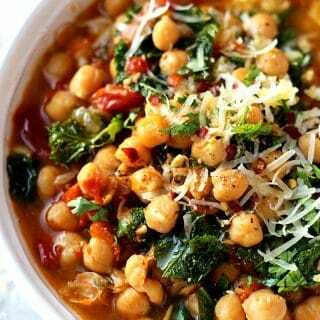 Place all the ingredients in a slow cooker/ crock pot and cook on high for 5-6 hours or on low for 8 hours. Remove all the broth and transfer to a Mason jar. Store in the refrigerator for up to 2 weeks. Slice the beef and serve with the vegetates alone or over rice. I’m definitely a warm meals person too. 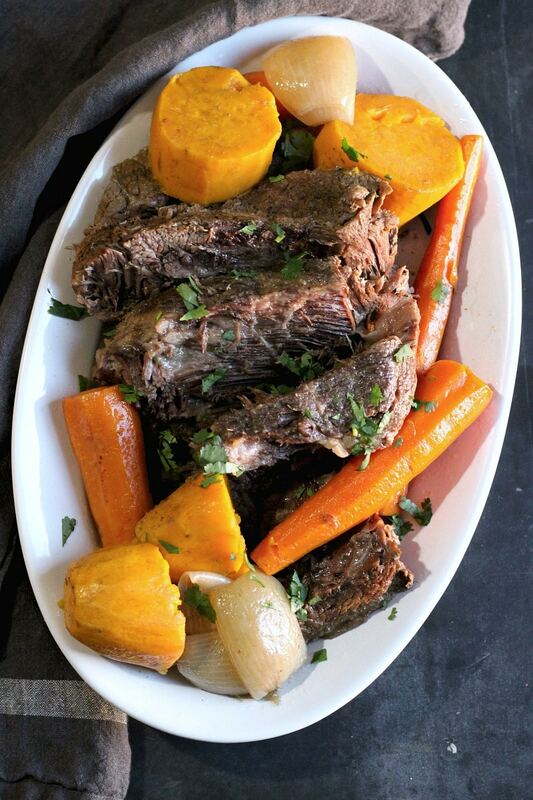 This slow cooker roast sounds just the comforting meal I’d love to eat right now! 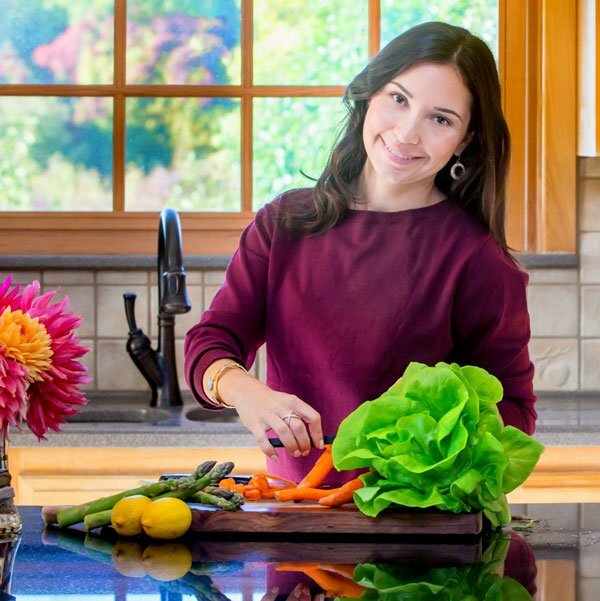 It was such a big discovery for me because I never understood why I felt so unsettled whenever I ate a lot of raw foods. Now I avoid it or add roasted vegetables to my salads, or even ginger to ‘warm things up’. Thanks for stopping by Andrea! 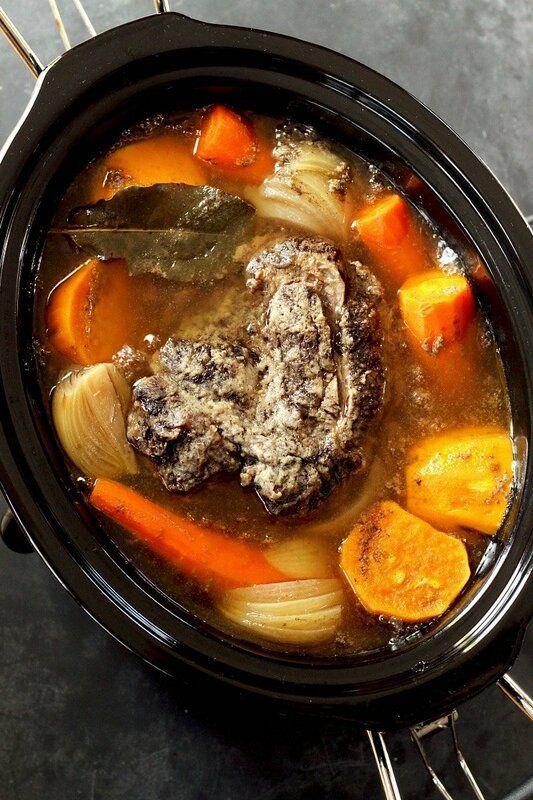 There’s nothing more satisfying that shoving the makings of a meal into the slow cooker, setting it up to cook over the next few hours, breathing in the increasingly wonderful smells until it’s finally ready! So glad you liked it Tara!! I am so with you about wanting this kind of food during the chilly part of spring. 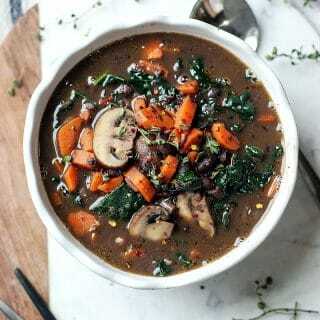 It is rainy and in the 40s here today and I was so glad to have left-over beef stew to warm up with for lunch. As far as warm vs raw/cold I think I am a blend. I make a shift in the summer months to enjoy more cold raw food. Though I do enjoy salads year round. Love this classic dish by the way.